The island town of Korčula boasts an atmospheric Old Town, a smattering of little museums, and a dramatic, fjord-like mountain backdrop. Humbler than its glitzy big sister Hvar, Korčula — while certainly on the tourist trail — is sleepier and has an appealing (and occasionally frustrating) backwater charm. At its heart, Korčula is a traditional, blue-collar, salt-of-the-earth shipbuilding and fishing town with a dim patina of tourism. All things considered, Korčula is the most enjoyable Back Door stopover between Split and Dubrovnik. One of the most popular water sport activities in Korcula, thanks to the Korčula weather is windsurfing. The island is located in a prime position to catch the perfect afternoon Maestral – a summer wind that allows windsurfers to enjoy plenty of movement out on the waters. Gliding over the open sea connects guests and locals alike. All levels of skill are welcome to join in the sport. Windsurfing schools offer lessons in areas on the island where the wind is less intense, and equipment designed for beginners is available for use at these schools. 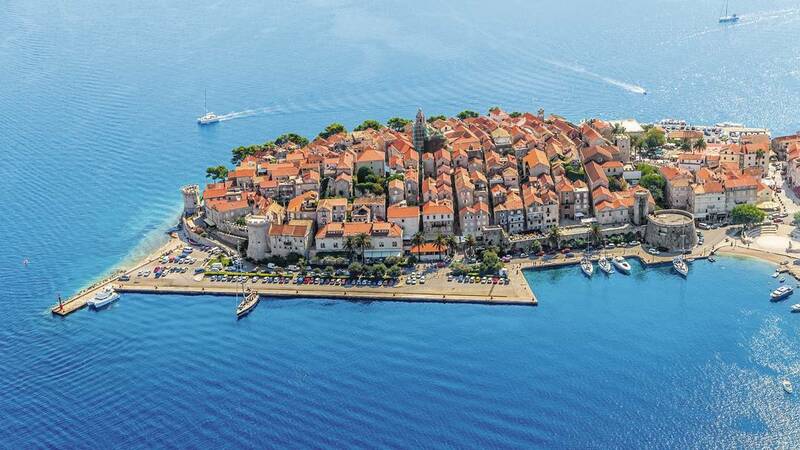 Many believe that that Marco Polo, the famous world traveler, writer, and explorer, was born on Korcula.Located on Ulica Depolo street, a visit to Marco Polo’s alleged birthplace is something history, and mystery lovers will enjoy. A portion of the house is available for guests to explore and the view from inside over Korcula’s Old Town is quite spectacular! A small fee to enter is required, but children under 10 are free. The home is open April thru October for tours. The location of Korcula island makes it perfect for two seafood and wine! Croatia’s southern Dalmatian region is known for its awarded wines, and Korcula has the perfect environment for producing two of them – Pošip and Grk. These varieties of white wine can be ordered at most restaurants on the island, so don’t hesitate to indulge in a drink…or two! Of notable mention is the fact that you will not find Grk anywhere else in the world other than in the vineyards that surround Lumbarda just one more reason to enjoy a glass of this famous wine while relaxing on the shores of Korcula Island. Eating seafood to your heart’s content is also advised while staying on the island. Mediterranean fresh fish, caught off Korcula’s shores, are prepared in local restaurants. It’s top notch eating when Croatian seafood is on the menu. An absolute-must-do thing in Korcula is to experience the traditional sword dance and drama known as Moreska. Performed on an open-air stage near Old Town, visitors can watch this theatrical and cultural dance from the 16th century during the summer months on Monday and Thursday evenings. The dance depicts a conflict between kings, seven circles of dancers “battle” with swords to the beat of drums and the sound of bagpipes. A sure crowd pleaser! Another great cultural experience is to learn to cook the local specialty – Zrnovksa Makaruni. This dish is comprised of homemade pasta shaped tubes topped with sauce – similar to goulash. The family runs Konoba Belin offers pasta making lessons for those willing to take on the culinary challenge, but if you prefer not to cook on holiday, we still suggest making the trip to Zrnovo just to try this restaurant’s version of the dish. 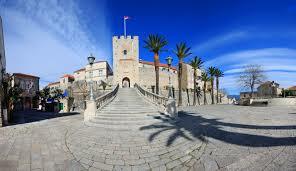 Korcula has received the name “Little Dubrovnik” and it’s Korcula Old Town that can take the credit for the nickname. Built on a small peninsula jutting into the Peljesac Channel, the medieval walled Old Town boasts the same picturesque Venetian-style buildings with red rooftops as Dubrovnik. The city sits on the UNESCO list and is an important part of the island’s history. Located at the center of this town is St. Mark’s Cathedral – a stunning Gothic-Renaissance styled church. Built on the highest point of the peninsula, the church is said to be the most important building in Old Town and viewing this architectural wonder is a must. A stop at the Korcula Town Museum is an interesting way to learn about the island of Korcula, her history, and the view of Old Town from inside Marco Polo’s supposed home of birth can’t be beaten. After wandering the narrow streets, grab a bite to eat one of the many restaurants and cafes or catch a new Hollywood release or independent film at the open-air cinema. If you plan to stay on Korcula Island for any length of time, then you’ll want to take a day trip and explore Croatia beyond the city – take a look at these tours to see which suits you best. With these tours, you can book ahead, guarantee your place and save money or you can also find options when you arrive. Okay, so not alllll the way across. Walking and hiking paths are plentiful on Korcula Island, and so many lead to great hidden delights. If you are in need of solitude or perhaps a break from the busy town, put a walk on your list of things to do in Korcula. Zrnovo, a small village near the town of Korcula, offers a variety of trails for all levels of endurance. A protected landscape, Kocje, is found within a moderate 40-minute walking distance from Zrnovo. This unique landscape is full of rock formations and stone mazes for those looking to explore a little more. Plus, you will also be able to enjoy some stunning views accros the channel to Peljesac mainland. Croatian beaches are usually pebbled, but the village of Lumbarda boasts two fantastic sandy beaches. Buckets & spades at the ready, it’s time to build sandcastles at Przina or Bilin Zal beaches, just a 15-minute bus ride from Korcula Town. And for after, it’s got to be ice-cream and yes, the island makes some delicious gelato. One of Korcula’s Islands most popular beaches, for tourists and locals alike, is Vela Przina Beach. Found in the village of Lumbarda on the southern side of the island (a 15-minute bus ride from Korcula Town), this beach has beautiful, sandy shores and is settled in a large bay offering amazing views of the sea. Arrive early to get a good spot and spend the day here, enjoying the beach cafes, a game of sand volleyball and the radiant sunshine. The other sandy beach on Korcula Island, Bilin Zal is found about 4 km from Korcula Old Town in Lumbarda. The water is not as crystal clear here, due to the sandy bottom, but it’s that sand that brings locals and tourists to this beach for a chance to go barefoot on shore and in sea. The beach is ideal for families and young children, but it’s important to note that no natural shade can be found at this location, so be shure to pack a pop tent with you. Should you find yourself hungry, Konoba Bilin Zal is the perfect place to grab a bite to eat. Located in the bay of Pupnatska Luka this gorgeous, small, pebble beach is popular for swimming. Crystal clear waters invite locals and tourists, to take a dip and even those who wish to remain dry won’t be disappointed with the picturesque views of the channel from the shoreline. With chair & kayak rentals, portable toilets, various restaurants in the bay and the close proximity to Korcula Town (15 km away), this beach is incredibly family friendly and one of the more popular beaches on Korcula Island. The Korcula is well known for Moreska – a traditional sword dance and drama that was common through the Mediterranean in 12th and 13th century, reaching Korcula in 16th century from Italy and Dubrovnik. Briefly, the dance follows the story of the conflict between the Red King (locally called “White”) versus Black King and their soldiers, as Bula – the Red King’s fiancée is captured by Black army. Following the dialogues between Kings, the romantic and ritualized sword battle starts, and is performed in seven circles representing seven different dances with swords. Finally Black King is conquered and Bula happily returns into arms of her bellowed Red King.